Kennedy publicly rejected the idea that he had failed to get a mandate. "The margin is narrow, but the responsibility is clear," he said. "There may be difficul-ties with the Congress, but a margin of only one vote would still be a mandate." Nonetheless, Kennedy conducted himself with an acute awareness of the closeness of his win and of the tenuousness of his congressional majority. In the weeks following his election, he took care to appear above partisanship, thereby to reassure the country. His first two announced appointees were incumbents whom he retained in their jobs, Allen Dulles, director of the Central Intelligence Agency (CIA), and J. Edgar Hoover, director of the Federal Bureau of Investigation (FBI). Several weeks later Kennedy chose C. Douglas Dillon, the incumbent under secretary of state, who had contributed money to the Nixon campaign, as secretary of the treasury. Kennedy made a well-publicized and unusual visit to Nixon several days after the election. In addition, he publicly thanked Eisenhower for his cooperation and assistance in the transition, which was marked by a cordiality sometimes lacking in the past, and he revealed that he had asked Eisenhower if he would be available for assignments in his administration. Kennedy's decision to postpone promised civil rights legislation reflected his recognition of congressional realities. He did not want to alienate southern Democrats, whose support he needed in other areas. Given the makeup of Congress, it would have been a futile gesture to seek civil rights legislation in 1961 anyway. Within the space of a few months, Kennedy transformed himself from a president-elect without a clear mandate to a highly popular incumbent who raised public expectations of the office. The most visible moment in this transformation came with his inauguration itself, where the contrast between him and Eisenhower could not have been more striking. Eisenhower was the oldest man to occupy the presidency until that time; Kennedy, at forty-three, was the youngest person ever elected president. Eisenhower was the last president born in the nineteenth century; Kennedy was the first born in the twentieth. Eisenhower had been the great World War II commander, and Kennedy, a mere junior officer. Eisenhower had grandchildren; Kennedy had a three-year-old daughter and a son who was born between election and inauguration. Eisenhower had taken care not to endanger his personal popularity by taking on divisive causes and had practiced a kind of indirect leadership, so indirect as often to be undetectable; Kennedy advocated that the president be at the center of the action. Let the word go forth from this time and place, to friend and foe alike, that the torch has been passed to a new generation of Americans, born in this century, tempered by war, disciplined by a hard and bitter peace, proud of our ancient heritage, and unwilling to witness or permit the slow undoing of those human rights to which this nation has always been committed, and to which we are committed today at home and around the world. In the long history of the world, only a few generations have been granted the role of defending freedom in its hour of maximum danger. I do not shrink from this responsibility; I welcome it. I do not believe that any of us would exchange places with any other people or any other generation. The energy, the faith, the devotion which we bring to this endeavor will light our country and all who serve it, and the glow from the fire can truly light the world. Kennedy embraced a universalistic conception of the country's international responsibilities that his successor and the Vietnam War's critics alike cited as a major reason for America's involvement in the war. "Let every nation know," he asserted, "whether it wishes us well or ill, that we shall pay any price, bear any burden, meet any hardship, support any friend, oppose any foe to assure the survival and the success of liberty." Yet even in this tough-sounding speech, Kennedy declared an interest in opening a dialogue with the Soviet Union to relax tensions and reduce the chance of war. "Let us never negotiate out of fear, but let us never fear to negotiate," he said in one of his most famous contrapuntal sentences. He also promised to help the world's poor help themselves "not because the Communists may be doing it . . . but because it is right. If a free society cannot help the many who are poor, it cannot save the few who are rich." To Latin Americans, he offered a special pledge, "a new alliance for progress, to assist free men and free governments in casting off the chains of poverty." Just as the inauguration and the inaugural address were studies in contrast, so too was the mood Kennedy set in his first months in office. Kennedy painted a sober, even grim picture of the world as he found it. Things were worse, he said, than he had expected, America's defenses were weaker, its position in certain international situations in greater jeopardy. Yet that sobriety was countered by his youth, vigor, self-confidence, and wit. He flooded Congress with requests, held frequent and impressive press conferences, and proposed bold new national goals, the most important of which was met—to place a man on the moon before the decade was out. "Above all, Kennedy held out such promise of hope," Arthur Schlesinger, Jr., the historian who served as his assistant, wrote. "Intelligence at last was being applied to public affairs. Euphoria reigned; we thought for a moment that the world was plastic and the future unlimited." Kennedy made an important innovation upon becoming president when he allowed press conferences to be televised live. He used these conferences to communicate directly with the public, which was immediately impressed with his personality, poise, and knowledge of government. As of May 1961, three out of four adults surveyed had seen at least one of his press conferences, and 91 percent had formed a favorable impression of Kennedy from them. The live press conference became Kennedy's communications forte. None of his successors has felt it possible to abandon the practice, though none has done as well by it. Here was a leading example of Kennedy's permanent effect on the presidency and public expectations of it. Another demanding legacy Kennedy bequeathed his successors lay in press relations. Kennedy, who had been a reporter briefly himself, followed the press closely, had friends among journalists, and sometimes sought the advice of certain columnists and reporters. Kennedy's immediate successors, Johnson and Nixon, each believed that the press had been infatuated with Kennedy and had treated him with kid gloves, in contrast to the rough treatment they received. In fact, Kennedy received a normal amount of criticism in print and collided with the press on news management (which Kennedy practiced), press self-censorship (which he advocated), and other matters. Like all presidents, he was pleased when he received praise in the press and unhappy when he received criticism. But the fact that his successors forgot the clashes and criticism suggests that Kennedy was at least highly successful in creating merely the impression of good press relations, which may be almost as good as the reality. Kennedy paid attention to the nation's culture. He honored leading writers, artists, poets, and musicians, and invited them to the White House. The recognition of artistic excellence fit Kennedy's expansive view of the president as the promoter of excellence in virtually all areas of the nation's life. Sympathetic to contemporary intellectual criticisms of mass culture, he appointed as chairman of the Federal Communications Commission Newton Minow, who promptly told the nation's broadcasters that if they ever watched television from morning to night, "I can assure you that you will observe a vast wasteland." At Kennedy's behest, the federal government began to provide aid for educational television. Kennedy also sought to raise aesthetic standards in the design of federal buildings and promoted historic preservation. Not surprisingly, the nation's cultural elite tended to return Kennedy's flattery and then some. Lewis Mumford, for example, in 1964 called Kennedy "the first American President to give art, literature and music a place of dignity in the national life." This was an exaggeration, but Kennedy did set an influential precedent for his immediate successors. 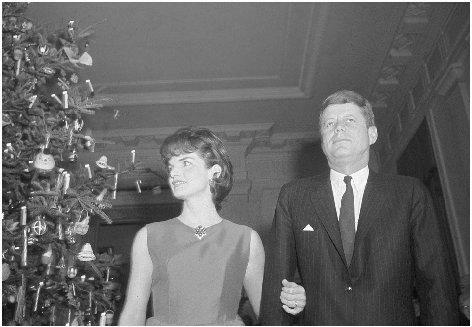 President John F. Kennedy and First Lady Jacqueline Kennedy stand by the White House Christmas tree in the main entrance hall of the White House, 12 December 1962.
embarked on careers in government and politics, which Kennedy gave a respectability and appeal they had usually lacked. Partly as a result of his influence, television news and public affairs broadcasting expanded dramatically. The social questioning that Kennedy sanctioned and encouraged led some people to ideological conclusions that Kennedy rejected. His presidency saw a rise in both radical and conservative movements, but Kennedy was comfortable with neither extreme. He was not even comfortable with liberalism, though he counted many liberals as his allies and though he espoused many liberal programs. Kennedy described himself as an "idealist without illusions." He was a pragmatist and problem solver who perceived the limitations, as well as the possibilities, of presidential power. As a politician, he worried about his reelection and about how Congress and the public received his suggestions. He believed that many problems called out for new and essentially technical solutions. The central issues of our time, Kennedy said in a speech at Yale in 1962, "relate not to basic clashes of philosophy or ideology but to ways and means of reaching common goals." Kennedy declared, "What we need is not labels and clichés but more basic discussion of the sophisticated and technical issues involved in keeping a great economic machinery moving ahead." Liberals sometimes faulted Kennedy for being too rational and cool. They wanted a more passionate and feeling leadership than he usually projected. They hoped he would mount the "bully pulpit," as Theodore Roosevelt described it, to preach to the public and rally it behind just causes. Kennedy certainly liked to think of himself as a leader, but as a practical politician he was disinclined to lead futile crusades. The most compelling moral cause of Kennedy's years as president was civil rights, and it is therefore worth looking at his handling of it in some detail.